This is Kamola Akhmedova, the owner of Afandi Asian Grill. Afandi is a title shortened from Nasreddin Afandi, the name of a fictional character whose story of being a traveler on the Silk Road is very popular in Kamola’s native country of Uzbekistan. Kamola moved to New York in 2013 after meeting her fiance at The MET during a business trip for her parents manufacturing company. The company, which specializes in the manufacturing of ice cream and frozen foods, was looking to expand it’s product line and Kamola was meeting with clients in New York. Her husband, who is also originally from Uzbekistan, overheard her talking on the phone and struck up a conversation with her. Five months later, after dating long distance, they decided to get married and Kamola moved back to New York permanently. She says it was one of the biggest decisions she’s ever made because she had been a part of her parents company for most of her life and wasn’t sure what she would do for work in New York. But soon after getting married she got pregnant and she spent the next two years raising her son and continuing to work remotely for her parents. In 2015 her husband decided to open his own shipping company and she began helping with the business, doing the bookkeeping and running operations. However, after a while, Kamola started getting interested in the food industry again, since she had worked in it for most of her life. She began thinking about how much she loved Uzbek food but it was all so heavy and greasy; there was no modern Uzbek food that would appeal to the market in New York. So she decided to open her own fast casual restaurant that would focus on a new version of Uzbek food but still would be able to educate New Yorkers about her culture. Uzbekistan is located in Central Asia so it has influences from both the Silk Road/the Western part of China and the Soviet Union, which makes both their culture and their food a very unique combination. Their breakfast food is most similar to the Soviet Union countries (pierogies, cheese pancakes, blintzes) but most of their traditional lunch and dinner dishes (Uzbek pilaf (plov), dumplings (manti) and noodle dishes (norin or lagman)) come from Western China and are very meat-heavy, containing either lamb or beef. Originally when she began pursuing a career in the food industry, Kamola did research into manufacturing, thinking that she could create a manufacturing business around Uzbek food. But she quickly realized that it would be too hard to replicate her parents’ operation without experience in the U.S. Her parents had been working in the manufacturing industry for years, first mass manufacturing ice cream and then expanding into frozen foods when she was 14, the same time that Kamola began working for them. She had started learning English in high school and since her parents don’t speak English, she would help them schedule meetings with their partners abroad. She attended an Australian university in Uzbekistan and continued her English classes, taking a bigger role in the company and travelling with her parents to international expos and conferences to help translate. Although her schedule was extremely full with work and school, she says she didn’t mind it because she was always passionate about being in business. She didn’t know exactly what field she would pursue but always knew she would get into some area of business and be a business owner. Since Kamola had been surrounded by food from an early age and knew manufacturing wasn’t a viable option, she began thinking about the restaurant/cafe business because it was a smaller part of the food industry and a (seemingly) easier operation to run. She started doing research into food trends in New York and found that vegetarian and vegan options were very popular. 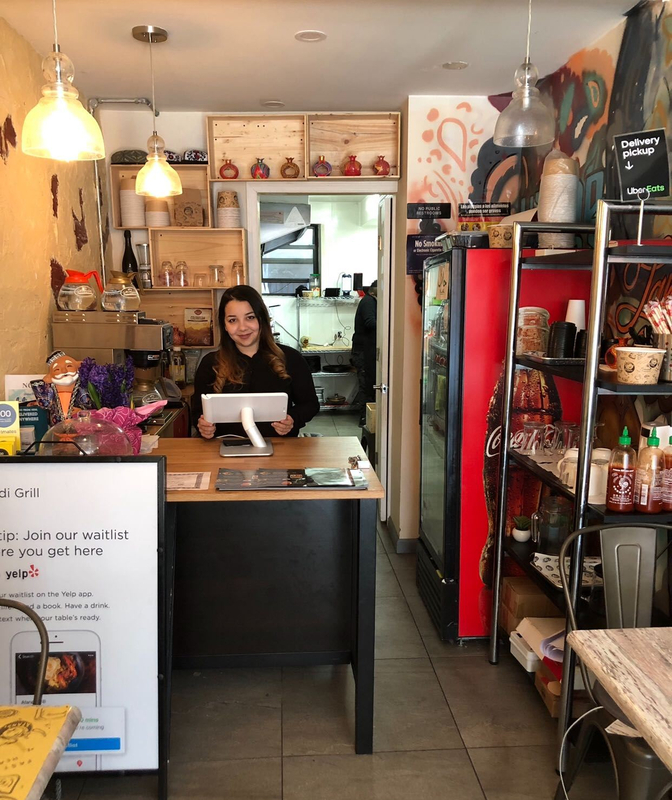 She thought there could be a way to make Uzbek food lighter and healthier with vegan and vegetarians options; an “every day meal” that would attract recurring customers rather than a heavy experience that they splurged on every once in a while. However, although she knew how to cook and had business experience, she didn’t have any experience in the restaurant industry, so she spent the next year learning. She wanted to do her research into the business and decrease her risks as much as possible so she started going into different restaurants in Uzbekistan and asking chefs for help. She worked with these chefs to deeply understand and learn their recipes and then she made them every day until she learned how to create every dish. Then she started working backwards seeing where she could substitute ingredients for lighter, healthier and/or veggie-friendly options. She spent six months in Uzbekistan and six months in New York learning and working on the menu before deciding if she could even open a restaurant. But her research paid off. She constructed a simple menu that included some main, authentic Uzbek dishes as well as the vegan and vegetarian options that she had created. Once that was complete, she made a business plan and started looking for restaurant spaces in the East Village since it’s a traditionally Ukrainian area that customers are drawn to. She ended up finding a small space with a kitchen on 1st Avenue and her restaurant opened in September 2018. It’s one of the first Uzbek restaurants in Manhattan. Since her business has only been open for about six months, Kamola says there’s still a lot to be done to get more customers into the restaurant. She admits that it’s been difficult to gain interest from customers because it’s something new but she tries to explain the cuisine to every single customer that comes in so that he/she understands the influences that make it unique. She’s incorporated a lot of the Uzbek culture into the store design (statue of Afandi, Uzbek paintings, cups and bowls) but also tries to show the creation of her modern Uzbek food by depicting the meshing of New York City and Uzbekistan with the image of two American women wearing Uzbek hats. She’s also very aware of the impact of social media on food businesses and is trying to do more on Instagram and Facebook so that their audience will get to know her business and the mission behind it. She’s been inviting influencers to come to the restaurant and try the food for free in exchange for a social media post and even created a “green wall” to make the restaurant more picturesque for social media. However, as difficult as it’s been for Kamola to get her business to stand out in a saturated market, she says that the most difficult part of being a woman-owned business is being able to balance your family and your business. It feels like there’s never enough time in the day for her to manage both aspects of her life and that gets really tough. Her son is her biggest motivation to make the business successful but even when she’s thinking about the business throughout the day, she’s always thinking about her son. Although she really enjoys her job, she has to work to support her family and it’s always challenging trying to figure out how to balance everything. It frustrates her as a business owner and mother that there’s not one clear solution but she hopes that over time she can find a routine that works for her. Kamola’s immediate plans for Afandi Asian Grill include expanding their menu to incorporate more food from other Soviet Union countries and starting to offer brunch on the weekends. But long-term she plans to open another restaurant that’s smaller with only counter service and grab-n-go food. She’d like to open a small manufacturing facility in Brooklyn where all of the Uzbek food would be cooked and then transported to these small restaurants that would eventually expand throughout the city. However, this operation requires more financing so she plans to do more research into the logistics to see what would be feasible in New York. She’s started going to more networking events and meet-ups to make connections and learn from people who have been successful in the food industry. Understanding how other women have grown their businesses and garnering their advice is very important to her. Kamola relies heavily on her research and being a new business owner, it’s one of her two pieces of advice for female entrepreneurs looking to get into the food industry: do as much research as possible and then get as much experience as possible. She doesn’t regret her path into the restaurant business but looking back she wishes that she knew more about restaurants and how many things you have to handle as a business owner before jumping in. She says if she had realized, she definitely would’ve worked in a restaurant to get more experience first, even if she had to work for free. Because at the end of the day, it doesn’t matter what cuisine you’re cooking, real life experience in a kitchen is more important than anything else. Need catering for you and your team? Contact us! Previous Entry:Feelin Lucky? Try Our Bangers & Mash!